Browse through the above gallery, which showcases some of our website design work for our clients in Portsmouth NH, Rochester NH, Bethesda MD, Seminole FL, South Portland ME, Cambridge MA. Please visit our Clients page to view a list of some of our clients and links to their websites that we've worked on. These are projects involving both front-end design and back-end web application development. We do not display our web design and web development work that we do as a subcontractor to other web design consulting companies. However, we would be glad to show you some of our work if you are looking for a web site relating to a particular industry. Please send us a request. 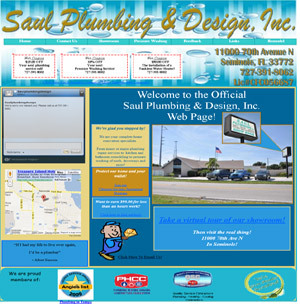 Our client, the Saul Plumbing & Design, Inc in Seminole, FL wanted to have his business website revamped. Click the "After Site Redesign" snapshot photo to view the new website. 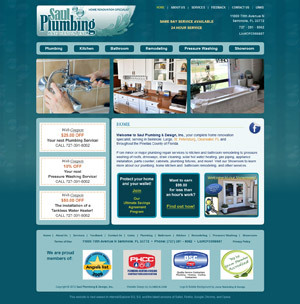 It Is the result of our efforts in restructuring and reorganizing the site to make it user-friendly, easy to browse and navigate while giving it a new look and feel that is professional and really identifies the company brand and its plumbing and home renovation services. We also do logo design as an additional service. The logo images below are copyright to the respective owners. Here's a list of some of the industries that we've worked on.